Exceptional Post and Beam Authentic Timber Frame Barn in Kent, Ct. Fully restored and converted with all modern amenities for vacation rental weekend getaway, parties or other events. Tastefully furnished with high end accessories, gourmet kitchen appliances, open floor plan with private sleeping quarters and loft areas. Huge fireplace and wood burning stove add warmth and drama! Private residential residence. Excellent group lodging facility. Relax and enjoy the full sized high quality pool table, built in swimming pool, bar, professional gym facilities and scenic grounds with horses, free-range chickens and more. The barn also offers a professional grade garage band style music experience, complete with amplification, guitars, keyboard, drums, mic stands and setups, bass, and more. A great place for family gathering. I am a local craftsmen, fine home builder and musician married with four children. We encourage travelers from all backgrounds to come visit Kent and explore the Litchfield Hills. We love Kent for its unique blend of rural simplicity and cultural flair. The air is crisp, the water is clean and the rural underpinnings of this progressive town instill a calm tranquility and measured appreciation of the natural surroundings accessible to all from The Spirit Horse Farm. Our farm dates back to the founding of Kent, and remains an iconic property which once housed the local nursery school and kindergarten. The Litchfield Hills offers visitors an exciting mix of easy country living with up to date cultural experiences in arts, music, entertainment, shopping and fine dining. Kent offers travelers access to all of these benefits plus offers great outdoor activities including hiking the Appalachian Trail, fishing, rafting and kayaking the Housatonic, or exploring miles of preserved land. Motorcyclists, and automobile enthusiasts also find Kent to be the perfect destination or way point while driving the Route 7 corridor through the Bershire foothills. 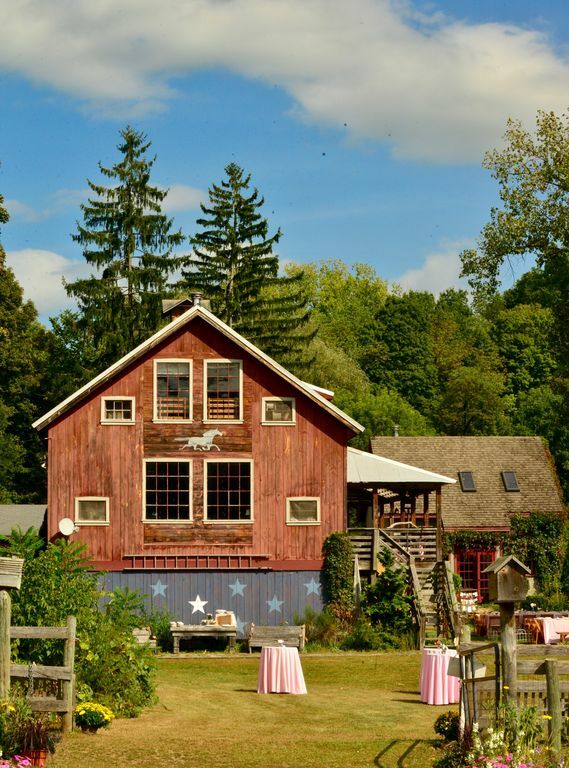 The Spirit Horse Farm is located just at the north end of town and offers both convenience and a private retreat for rest and contemplation at the end of the day. Night time activities include barbequing, fireside gatherings indoors or out, and an opportunity to visit with the horses, work out in the gym, shoot a game of pool, or swim in the moonlight. Kent offers wonderful shopping and dinging experiences! Great Hiking along the Appalachian Trail, plus great shorter hikes including Kent Falls, Numeral Rock, Cobble Mountain and Bull Bridge Falls. Our home is nestled in the Housatonic Valley, with Segar and Skiff Mountains to our East and West. Very large and Dramatice floor to ceiling custom stone fireplace. Firewood included. Full gym with free weights, rowing, recumbent bike, smith machine, heavy bag, benches, leg press and more. Tandem kayak, $25 per day. Full Professional Gym, Horses! Vegetable and herb gardens, Music Room with professional band equipment, bar, outdoor shower, outdoor patios, outdoor fireplaces, free-range chickens providing fresh eggs daily. Our fifth or sixth time back, it's a great spot....great restuaurants near by or cook in. Thanks Guy! My family had a wonderful weekend stay at the barn. Lots of character and fun things to do. We had a fantastic time at Spirit Horse Farm. The check-in process was seamless, the space is spectacular, the grounds are delightful, and the host was extremely helpful. Great kitchen for cooking for large groups, the firepit, the pool table, the drum set, the guitars. It's really a great destination for a fun weekend away. Beautiful, unique, wonderfully accommodating, we will come back! We had so much fun. 6 women. The farm is gorgeous and Guy was very accommodating. Beautiful property, very well kept, spacious, and I will be going back! My family and I absolutely LOVED our stay! Guy was such a great host and made it such a personal experience for us the entire stay. There is so much included with the stay, more so than any place I’ve visited. Guy left us a beautiful array of welcome gifts for the kitchen to help complement our stay. The interior was spacious, clean, lots of random art, and a fun interior. The pool was well kept and the kids loved playing in it. They also loved the close proximity to the friendly goats, chickens, and beautiful horses. This is a stay we definitely plan on making a yearly thing. So glad we found the Spirit Horse farm! We offer a 100% refund for cancelled dates as long as we can rebook your dates for equal value. Otherwise, we offer rain dates. Rain dates must be scheduled within 60 days of cancellation. Please note or standard check in time is after 4pm, and check out is by 11am. In some cases, we can extend check out or allow earlier check in times, but because we often have back to back bookings, it is not always possible to do so. Guests may 'purchase' early check in, or late check out, provided no others have already booked immediately preceding or following your visits for an additional $150.